My inventory management skills were not keeping up with my creative side and before I knew it I was inundated with too many finished quilts. That is, too many for the walls upstairs in our house where I decided to hang all finished quilts until they were sold. Not only was there visual overload but the drywall was becoming a pock marked pin cushion as quilts were sold and new ones hung in, of course, different places. My mother had always said that a quilt should be hanging SOMEWHERE even if it is the stairs to the basement. I knew the best way to maintain the quilts was hanging but all over the walls just wasn’t working. I thought a better solution would be to be able to hang them in groups, on some kind of hanging apparatus, sticking out from the wall. I could find safe places for something like this to protrude and not be a dangerous eye poke to ourselves and our visitors. I scoured the Internet for this vague idea of what I wanted knowing it would be a tool or hanging device for something else which I would use differently. I found my devices in the laundry hanging department! I bought eight simple white plastic laundry hanger holders, used individually in a laundry room for hanging clothes out of the dryer. I positioned these about 36-40” apart, level on the wall. 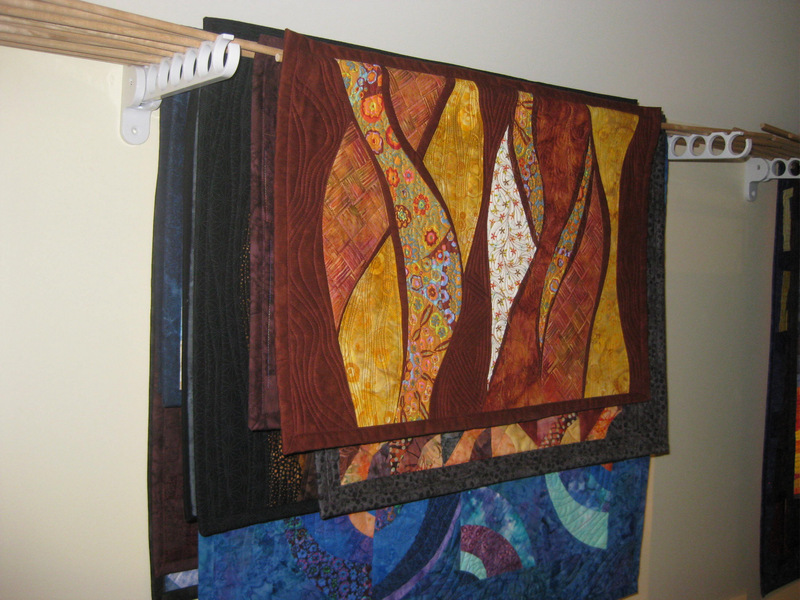 Then I used a 4’dowel slipped into the pocket of the wall quilt (where the quilts actual hanging dowel is also found) which rests on the plastic hanger units. See the photo included. I can fit about 15 quilts on every two hangers. It is perfect! I would love to hear what other quilters have devised for this challenge of how to store wall quilt inventory. Just read your article on storing quilts. It was a great idea and not terribly expensive. I would like to suggest that you put a fabric drop over the quilts -perhaps all but the one in the front to help protect from dust and sun light. I did not get your response in an email but was able to go in and read it on your site. It may be that I needed to check the box below for notification which I did this time. Great idea! Dust is more an issue than light as this room has no windows. I did not get an email response.